ARTCO is a project led by Kingulliit Productions and IsumaTV that engages children and youth across cultural divisions by using digital media to share experiences, resolve common problems and find new ways to communicate across old barriers towards a better future. In collaboration with local schools, a series of creative workshops lead by professional guests artists are given to two different groups of schoolchildren and throughout a multidisciplinary artistic process, the children use ARTCO iPods to create multimedia content, upload it wirelessly to the ARTCO website and explore the media that the other children have made. After going through the basics of video making, children are introduce to the Isuma-style video making which employs focused seeing through the camera as a simple ‘no fault’ way to discover meaning and empathy and to make better videos with minimal training. ARTCO uses a horizontal process which is designed to evolve. Workshop artists are not teachers but rather a different type of ARTCO participant. They are invited to explore different ways of sharing their artistic practice, to learn from the other disciplines by going through the ARTCO experience themselves and, to work together to mix their different art forms in a meaningful way for the children. Throughout the project children, local teachers, workshop artists and community organizers explore the power, the benefit and the creative energy of collective action. The ARTCO project gives children a very pleasurable experience with creativity and makes evident to them that the work of art we make impacts social environments in which we live and is a practical tool to lead collective action. As an action strategy ARTCO collects past knowledge and experience in a public space where people can learn from it. ARTCO uses new media tools to adapt to cultural historic strengths such as communication and consensus decision making, to new practical problems never imagined before, eg. mining, global warming, and language loss; and use the globalized and collective power of the internet to create a better future. In 2011, following the Peace Celebration Event held at Nastapoka River in Northern Québec by a small group of Inuit and Cree, Zacharias Kunuk (Inuit) and Neil Diamond (Cree) - two of Canada’s most respected filmmakers – interview Inuit and Cree Elders in the side-by-side communities of Kuujjuarapik and Whapmagootsui researching an old war story from the 1770’s and its impact on people today for their documentary film Inuit Cree Reconciliation. Designes as a parallel digital media project to the film lead, ARTCO encourages Inuit and Cree children to investigate the current relationship between both cultures, and - as a healing process - start creating new possibilities for their shared future. ARTCO teaches children to use digital interactive media to express their concerns and dreams, to explore their daily reality and cultural history, and build bridges across national and cultural barriers. 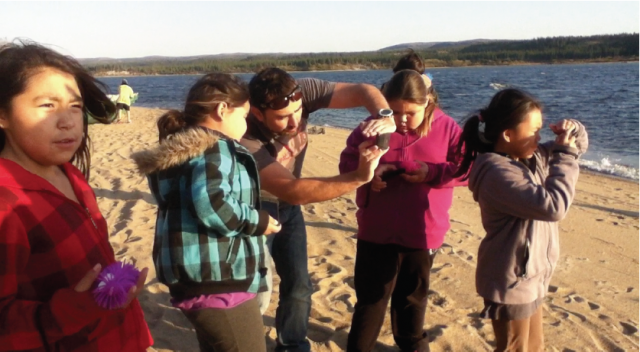 Bringing ARTCO to Great Whale River in 2011-12, while Kunuk and Diamond are researching the past, gives children in both communities the chance to join in this process, and express their ideas. ARTCO explores daily life as an expression of cultural values, an approach easier for children to follow when working with delicate subjects like historical violence and conflict resolution. The process of creation enables children to engage in their communities – history, reality, family – to understand themselves in the present and to imagine new possibilities for the future. 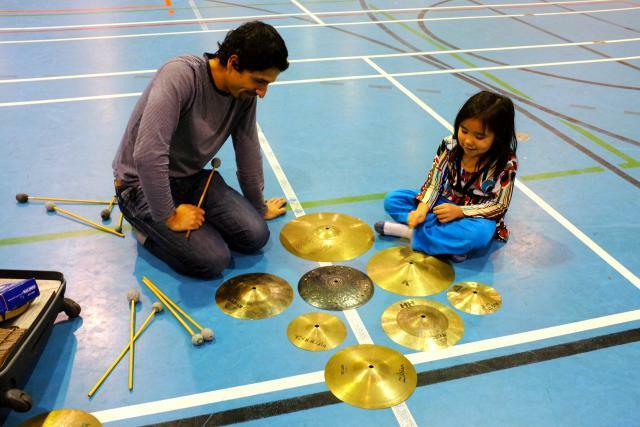 Between two conflicting cultures ARTCO enables Inuit and Cree children to connect to others who are like themselves and to discover, share and learn from common experiences and interests. Great Whale River is the northernmost Cree village in Quebec and the southernmost Inuit village in Quebec. 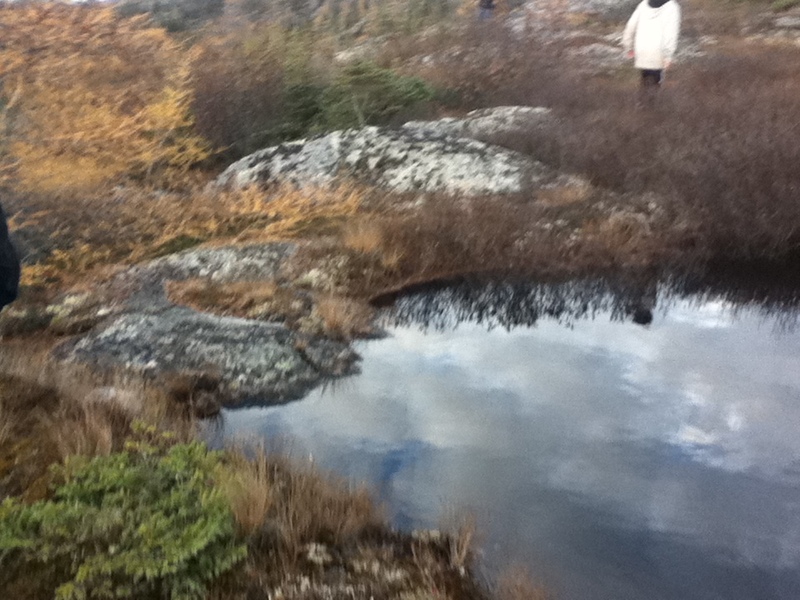 Located at the mouth of the Great Whale River on the coast of Hudson Bay in Nunavik, Quebec, Canada. 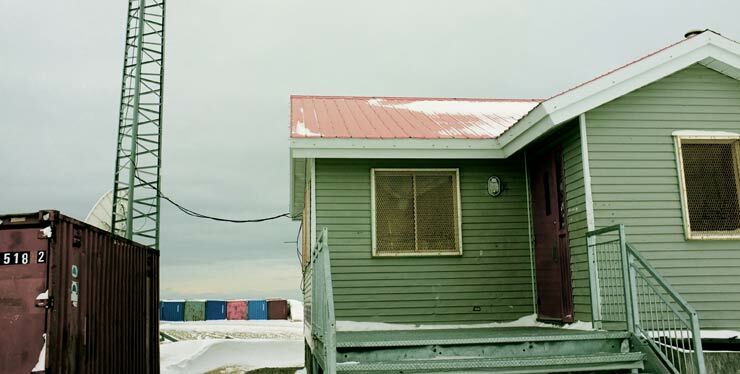 The community is inhabited by approximately 500 Inuit people and 800 Cree people and it’s only accessible by air and, in late summer, by boat. The community has four names Kuujjuarapik (small great river in Inuktitut), Whapmagoostui (place of the beluga in Cree), Poste-de-la-Baleine in French, and Great Whale River in English. Although the permanent cohabitation of Inuit and Cree at the mouth of the Great Whale River only goes back to the year 1950s, the two nations have been side by side in this area for a very long time; Inuit living on the coast and the Cree inhabitating the interior lands. 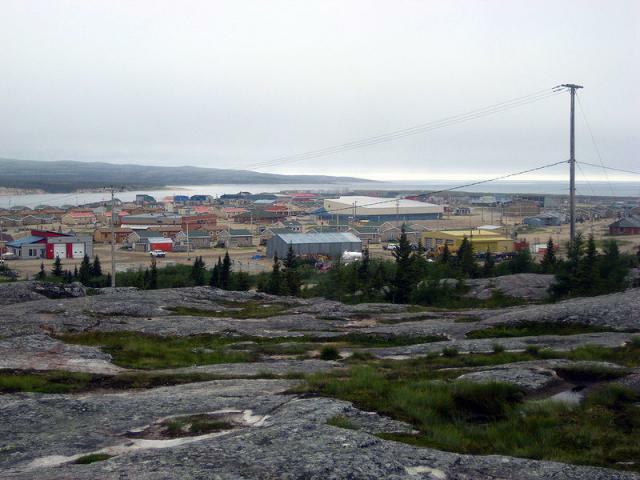 Members of both Inuit and Cree communities – share Kuujjuarapik-Whapmagoostui though physically and politically divided into two distinct villages. Like in many other communities in Northern Canada, some of the difficulties children face in Kuujjuarapik – Whapmagoostui are a high suicide rate, alcoholism, drug abuse, anxiety, depression, negligence from parents, sexual and physical abuse, poverty, malnutrition, illiteracy and violence. Average temperature is maximum +15c and minimum -27c. Because of the community's isolation, goods, including food, are mostly shipped by air. As in the rest of Northern Canada the community has one of the slowest and most expense internet connections in Canada. The majority of the teachers working in the North are originally from other regions in Canada or the world, as far as Nigeria or Poland. Because they are not from the community, the majority of them stay only one or two years to teach. Developing ARTCO in this community meant flying in all the artists and materials, installing two satellite dishes with an internet connection devoted to the project and with Wi-Fi access so that children could upload directly from their iPods from anywhere in and around the school. 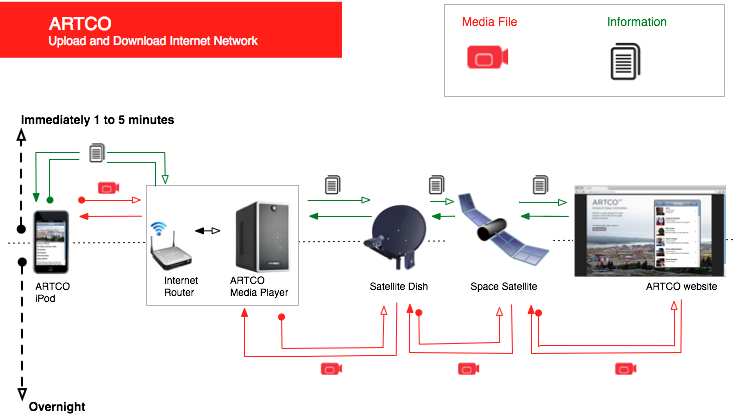 Because uploading and viewing media on the internet in this part of the world is so slow and difficult, ARTCO installed two IsumaTV local servers to be able to upload and view videos at high speed. New media technologies attract the attention of children in a powerful way. Due to the different difficulties children face in this community and others in Northern Canada, getting children’s attention and commitment is usually very hard in these communities. Within ARTCO, the children get actively involved in the workshops and the production, attracting the attention of other children and people in the community. Some of the children start to express and share more than they usually do, some find a way of expressing their emotions and others started to exercise their leadership towards the benefit of the group. 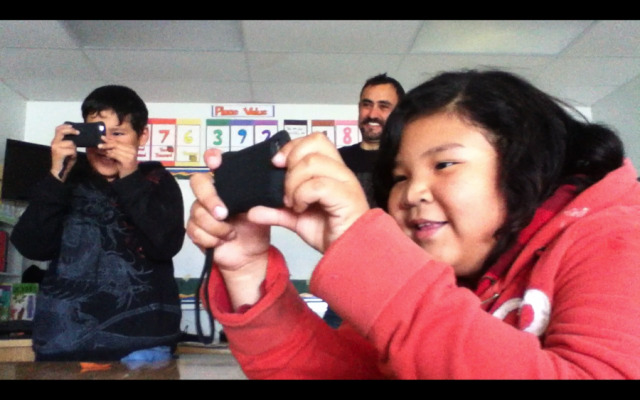 By making videos with their iPods the children start to see their environment, strengthening the capacity of understanding. 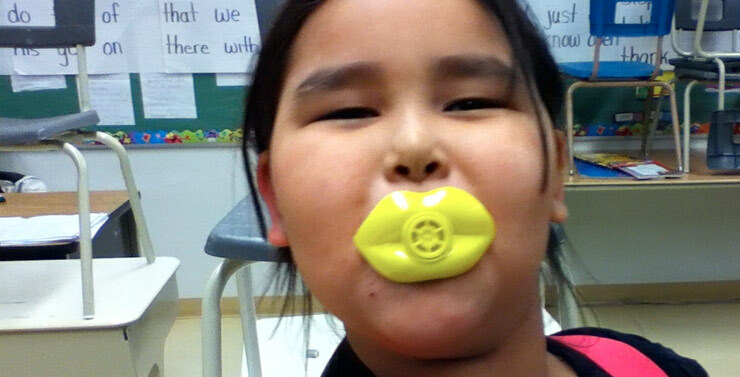 Through a safe space on the web Inuit and Cree children share the media they make and start to discover one another, recognizing their common interests. By doing so each day they build the possibility of working together. The participants experiment the deepness of the act of creating. The meaning that a work of art that can be shown to others, in which their presentation before the world is different before and after the work of art. 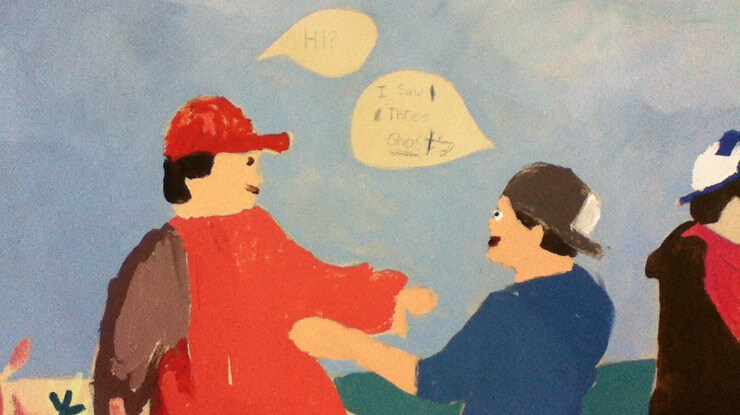 The children understand the powerful effect the work of art has in their social environment. “It’s important to have ‘a physical object’ at the end of the project. A DVD or an album of printed pictures. Something they can share with other children without needing the Internet and that makes them feel they were part of a project. Something they can touch”. This was especially clear when they learned how to use iMovie within the iPod and insert titles to the places they wanted to show. The videos had voice-over showing the different buildings of the community or the different rooms of their houses. Others had music throughout the videos and titles showing the different areas. This was one of the most popular subjects. Children are really interested in showing pictures and videos of their brothers or sisters. This was important for the teachers (who all come from different parts of Canada or other countries). They expressed how they got to know the intimacy of the reality the children they work with live in. 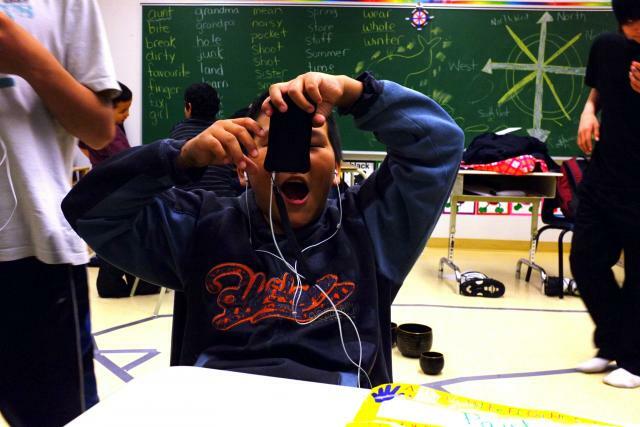 Cree children seem to have more access to computers, iPods and video games. Cree children recorded their friends and them playing video games, playing with their little siblings or dancing to music videos. Inuit children were more reserved about their families and tended to show more animals, landscapes, friends and things they watched on TV. It seemed that the majority of the children knew each other. This is not hard to imagine given how small the community is and the fact that they cross their paths at the gym, airport, restaurant or grocery stores. Yet we had a hard time when trying to work with them together. At the rehearsal we did the day before the exhibition the Cree children didn’t want to enter the gym because they were afraid of the Inuit. We had to deal with situations like the ones described below. 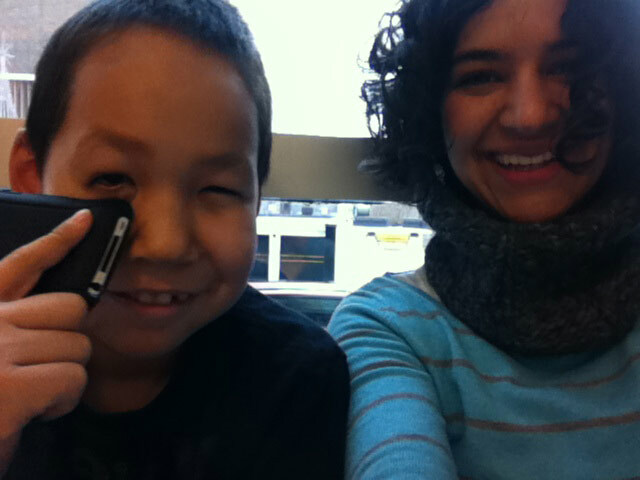 Cree child A goes to Gabriela and says surprised: Oh… but these Inuit are younger than us. Cree child A: affirmed with his head. Teacher: they were talking about that the whole day I had a hard time convincing them to show-up at the rehearsal. Inuit child A: I don’t want to participate, there are Cree there! 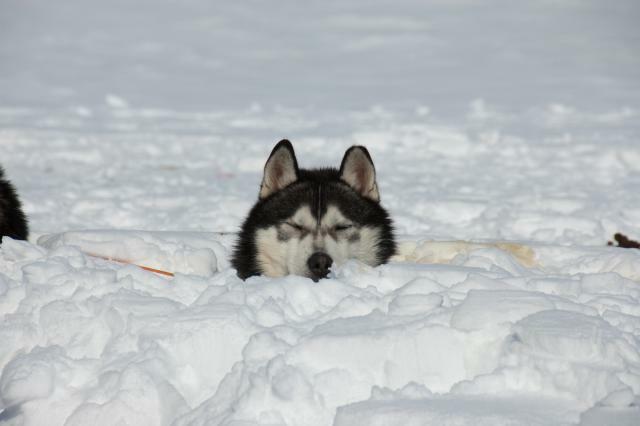 Inuit child B: I don’t want to. I hate the Cree. Gabriela said to Child B: they are ARTCO children, these are the children you have been looking at on the website all this time, these are the children we have been working with. It’s hard to know if it was what Gabriela told Child B, or Child B’s excitement to participate in making the whale, or both, but finally Child B participated. And so did the Cree children. 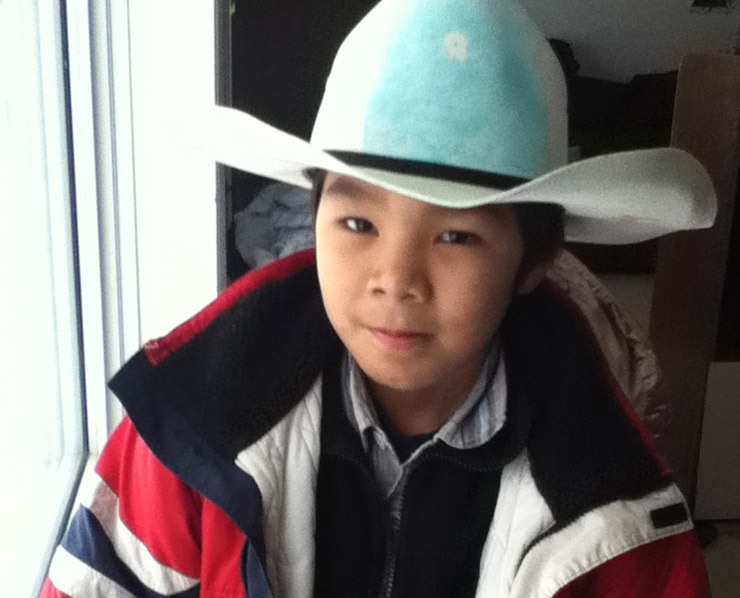 Not Inuit Child A though, even when he was one of the most participative one of all ARTCO children. Many other children at the gym joined us in this activity. Mostly Inuit and while we were doing the activity of cutting the tape in small pieces and drawing a huge whale in the floor no one seemed to care about the tension among them. They were all busy trying to figure out how the whale should look like and running to get more tape or providing tape. 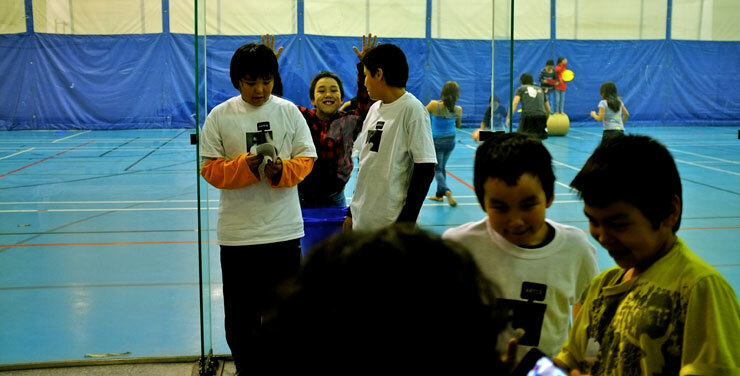 Cree Child A gave tape to a lot of the kids and one could see how he liked a lot this role, he laughed at the impatience of the smaller Inuit kids who were running to get more tape and running to put it in the floor. Some of the children had iPods or other devices. It would be interesting to give a workshop on how to use their existing devices to record and upload to ARTCO. The iPod is the simplest way because it goes directly to the website but you could upload pictures and videos from your older camera, or from your Nokia cell phone using a computer and the ARTCO website. “One thing I would add on top of what we did is to try to use their existing devices. Use their local resources so that they have the means to continue on their own. Or combine theirs and ours”. Throughout the project we noticed children in Kuujjuarpik-Whapmagoostui were very slow in reading and writing and some of them could not even read, because of that a lot of the children did not include titles in their productions. The website can use generic icons as tags as an option to titles. In 2012 Northern Canada's internet service is up to 500 times behind southern standards in terms of cost-per-kilobyte. Media files that permit audio-visual communication (i.e. oral, not literary) usually are too large, or too costly, to download or share. Simply downloading a browser application like Chrome can take up to 90 minutes even when using the ‘best’ internet services available. Low monthly data limits quickly are exhausted by media use. In Kuujjuarapik – Whapmagoostui, most children do not have access to a computer at home. If they do, they have extremely low-speed internet or no internet at all. 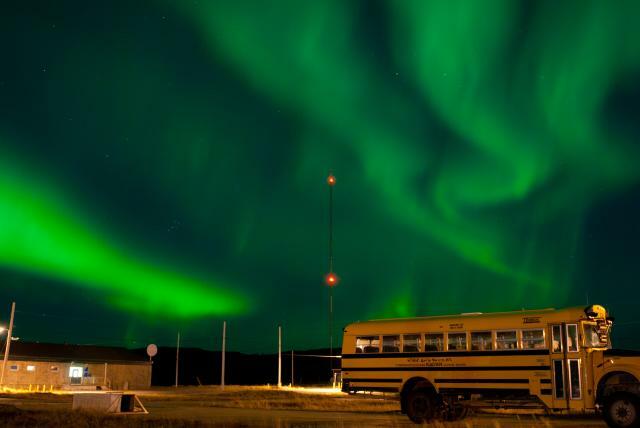 In both the Cree and the Inuit school, technology guidelines are set by school boards based in southern cities like Montreal, and by people who may never visit these isolated communities and who are unaware of their technological limitations. When problems arise, professionals must be flown in to fix them. This situation makes local staff uneasy about the addition of new technologies. Internet at both schools is only accessible to children on the school computers in the computer lab and during the computer class. In the Cree school some teachers have a computer only accessible to them in their classrooms . The ‘Media Player’ is a local server that allows people in the communities with low-bandwidth internet connections to view ARTCO’s multimedia content at high-speed even when using a slow internet connection. This technology, designed by Isuma, offers a solution to a problem many communities face in Northern Canada and worldwide: slow and expensive internet connections. To achieve it’s objectives, ARTCO designed and developed new functionalities for the IsumaTV Media Players enabling them to receive video, audio files and images created with the iPods. The created content is sent directly to the Media Players via WiFi. The media players look like desktop computers. They have to be plugged to the internet router which provides WiFi internet and is in turn connected to the modem that connects to the satellite dish. The multimedia that children upload to the media players is available immediately to the anyone else who is connected to the same network that the media player is connected to. 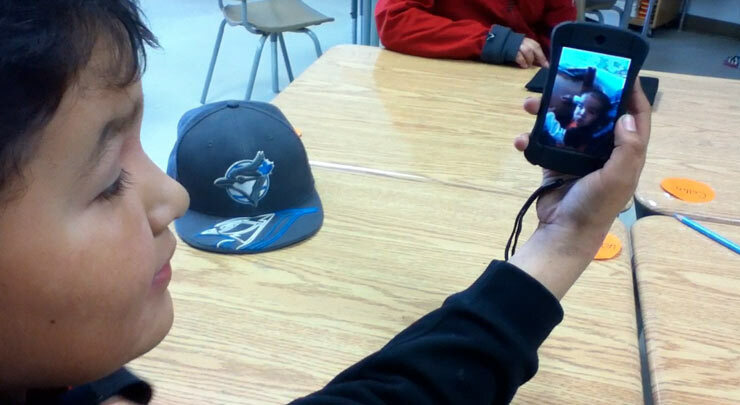 So, if an Inuit child uploads media to the Inuit school media player, anyone connected to the Inuit school network can view that video, photograph or audio immediately after it is uploaded. Overnight, this media is uploaded to the website and available worldwide. It allows children to have access to faster upload speeds and to playback their content almost immediately (approximately 1 to 2 minutes after the upload). Users download new content from the website only once. Each time someone connects to the internet network in which the media player is plugged, they are viewing the media at high-speed because it is coming from the media player, not from the website. This means that by using the media players people avoid downloading from the internet the video each time they want to play it, making the viewing experience fast and avoiding paying for the bandwidth it takes each time you view a video in one of these communities. All the media produced locally stays easily accesible locally but it is also shared worldwide through the website to which the content is uploaded automatically overnight, every night. In the same way, the community also has access to all the new content that is uploaded to ARTCO or to the IsumaTV platform which hosts ARTCO, after the media player downloads this new content overnight. This means that with the media players, the community has access to a large media library of indigenous productions: archives from the past and contemporary productions. In 2012 IsumaTV has 5,000 films made and uploaded by indigenous people from Canada and countries as Mexico, Greenland, Bolivia, Peru, Australia, Brazil, Mali, Russia, among many others, all of which are stored in the media players. Two new internet satellite connections and media players are installed in both the Inuit and Cree schools. ARTCO’s iPod application and website is designed to be visually intuitive with the least amount of text as a response to a combination of both, a strong oral cultural tradition and high illiteracy rates. Inuit and Cree children website profiles are listed under the same navigation menu, ordered alphabetically. 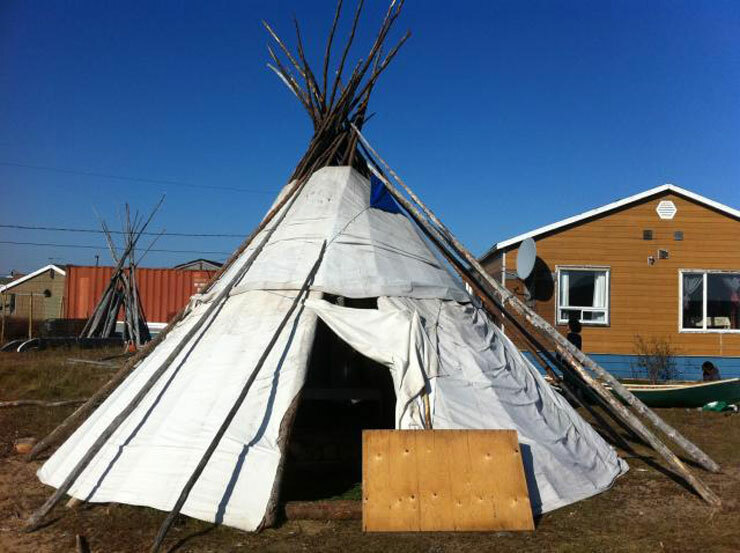 This structure promotes reconciliation between Inuit and Cree children in an indirect way, and encourages them to explore the media made by the other children. The iPods become not only the tools to create and upload media content but also the main tool to view the content the children produce. In Kuujjuarapik – Whapmagoostui most people rely on an internet connection provided by Tamaani Internet. In 2012 the basic internet connection offers: 512 Kbps download 128 Kbps upload, with a bandwidth limit of 10GB per month. If the user reaches the monthly bandwidth limit, the service for the remainder of the month is slowed down. In reality a user never experiences a 512 Kbps download speed as advertised, simply because a portion of the bandwidth is used by the modem and by the Internet Server Provider to keep the line open. In addition, the varying quality of the connection can also slow down the download and upload process. In fall 2011, while we were developing the activities, it was reported by the communitythat the download speeds were around 128 Kbps on the good days, and sometimes it could drop as low as 56 Kbps. The experience of downloading Google Chrome (40 MB) at a download speed of 64 Kbps would translate into a waiting time of 1.38 hours. In 2012 most of the systems at the Cree and Inuit schools in Kuujjuarapik/ Whapmagoostui are windows based systems, often only running Internet Explorer 7. While Firefox is installed also in all the terminals at the computer lab of the Cree school, it is not necessarily the case at the Inuit school. While it is more challenging to ensure a flawless interaction using technology from older browsers, it is important to keep in mind that a trade off is needed for those cases. Often installing a new piece of software (even a browser) might need to go through a special request through the school administration. In general, none of the children are allowed to use the internet or computer lab outside of a class. 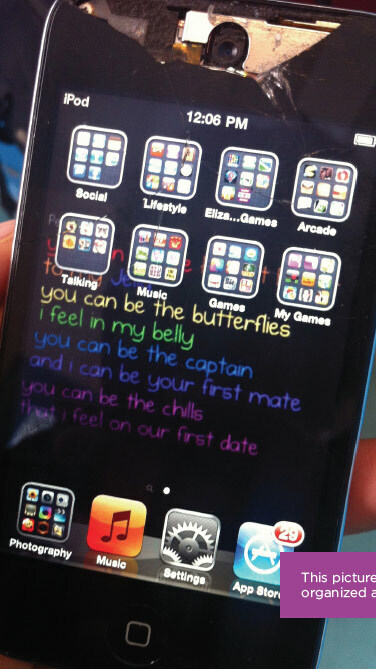 Children are not allowed to bring their iPods to school, nor connect to the wireless network. Some of the children reported that, during the weekends, they would stand just outside the school to have access to the ARTCO wireless network in order to upload content to the site. Some of the children have either an iPod touch, a camera phone or a desktop computer at home. Laptops are rare. Some people in the community own iPads. 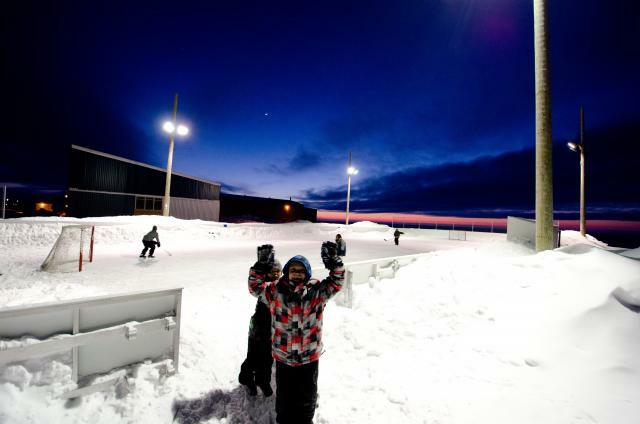 In 2012, most of the youth in Kuujjuarapik/Whapmagoostui spend their leisure time at either, the local gym, the youth center, outside playing on the hill or at the beach (depending on the weather conditions) or at home (often playing video games). At the gym there is a wireless internet connection accessible by all the visitors, it is not reliable and the weeks that we were visiting we never managed to connect to this resource. 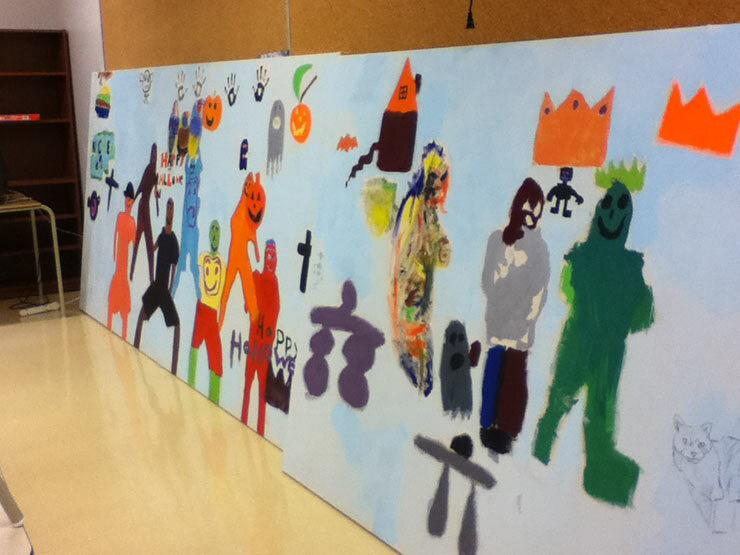 However, many or the children participating in ARTCO mentioned that they uploaded content from the gym. At the gym there is also a laptop used by the staff and it is often shared with visitors. The other internet access point is the Youth Centre. We did not have the opportunity to visit the computer facilities, however we were informed by the children that they had a few computers for common use running windows. Some o the children said that their parents have a computer with internet access though not all of them are always welcomed to use it. When that was the case, they visited a friend’s house that allowed them to browse the internet. All the children know about Facebook, there was also mention of Bebo and Hi5, no mention of Twitter or instagram. A large portion (if not all) of the older children and teenagers are on Facebook. Their privacy settings vary, some of them do not share anything outside or their circle of friends, some others have a rather open profile and their content is accessible. If they are not on the internet, they spend their computer time playing video games. Some of the children who do not have access to a computer have access to other devices to play video games. The content of the games played are rather simple, and the adoption of video games is not only among the children but also teenagers and young adults. For instance, at the local bar there is an arcade video game where the only objective is to keep a drunken man walking on a straight line by repeatedly pressing a left or right button. Among seniors, bingo is an important part of their evening social activities. People within the community take turns to lead the game and broadcast it through the local radio station. The radio station in these communities is of vital importance. Homes, offices and schools have the radio turned on all the time in order to hear the news in town. While the younger generations might often find the content a bit boring for them, it is still a way for them to learn about what is happening in town. This project is possible with the support of: Canada Media Fund, Isuma TV, Centre d'Etudes Nordiques Whapmagoostui-Kuujjuarapik Research Station and Air Inuit.